Northeast Texas Farmer’s Co-op is 80 Years Old! Home » Headlines » Northeast Texas Farmer’s Co-op is 80 Years Old! On March 24, 2019, “the Co-op” as it’s known in Sulphur Springs will begin it’s 80th year serving the farming community in Hopkins County and it’s member-patrons. For a good segment of our population, the Co-op is a household word, and almost a member of the family. Most everyone knows General Manager Brad Johnson, also Donnie Peters, Store Manager and Jim Ratzlaff, Credit Manager. Among the longest-serving employees are Joe Lee Jackson who began working there in 1963, and Debbie Horton who came onboard in 1976. Anita Stapleton joined the Co-op family in May 1971, and today holds the office of Controller. There is a separate staff developing feed formulations at the busy Feed Mill located across the street from the Farm and Ranch Center. Jan Taylor, Eusebio Vazquez, Larry Hatley, Charles Champion, Blake Smith and Antonio Sanchez all are employees with twenty five years or more tenure. According to Anita, “there will probably not be much fanfare this week at the 468 North Jackson Street location in Sulphur Springs, just a lot of hard-working individuals going about their jobs as more and more people shop at our stores. Having added a brand new Farm & Ranch Center in Clarksville in 2016, and with a new location for the Canton Farm and Ranch Center in 2017, we are now looking at remodeling the warehouse and garden area at our Sulphur Springs Farm & Ranch Center in the coming weeks of 2019”. That’s a far cry from the earliest history of the Co-op, where it started as a cotton gin near the railroad tracks and an early-day store near the intersection of Houston and Jackson Streets. With Spring coming on, all their services are in even greater demand, so get down to the Northeast Texas Farmer’s Co-op’s Farm and Ranch Centers in Sulphur Springs, Greenville, Canton and Clarksville and see what’s new inside and outside the store! And if you’re curious, for a bit of background, let’s take a look at the Co-op’s history. Founded in 1939, Farmers Cooperative Gin Association of Sulphur Springs was chartered by the State of Texas. This local agricultural cooperative was charged by its founding member/patrons to serve the predominant Cotton Industry of Hopkins County and Northeast Texas. With a governance structure of a 5-man board of directors and 100% local ownership, the “Co-op”, as it became generically known, assisted in the evolution of production agriculture in Northeast Texas. In the 1940’s, the agriculture industry in Northeast Texas began to grow and diversify. The dairy industry was an up and coming way of life. Animal agriculture would quickly outgrow row-crop agriculture, as the climate for growing good grasses became an advantage. The Co-op recognized these changes and assisted local producers by investing in a feed mill, supply store, and fertilizer blending plant. Serving rural and agriculture needs is indeed what a local agricultural co-op is all about, and these changes and investments helped the Co-op to grow in its ability to serve producers and the community, as well. While Hopkins County had become a predominantly dairy industry by the 1970’s, farming was still a way of life for several areas in Northeast Texas. The Co-op recognized these needs of producers and purchased a grain elevator and farm supply store in Hunt County in 1972. This elevator, with a capacity of 1.3 million bushels of grain, provided a market for local farmers and a source for grain to be used in dairy feed manufacturing. Wheat was marketed for farmers for export, while corn, sorghum, and soybeans were purchased to supply dairies in a seven county area. The elevator allowed the Co-op to store grains for the local marketplace until it was needed. 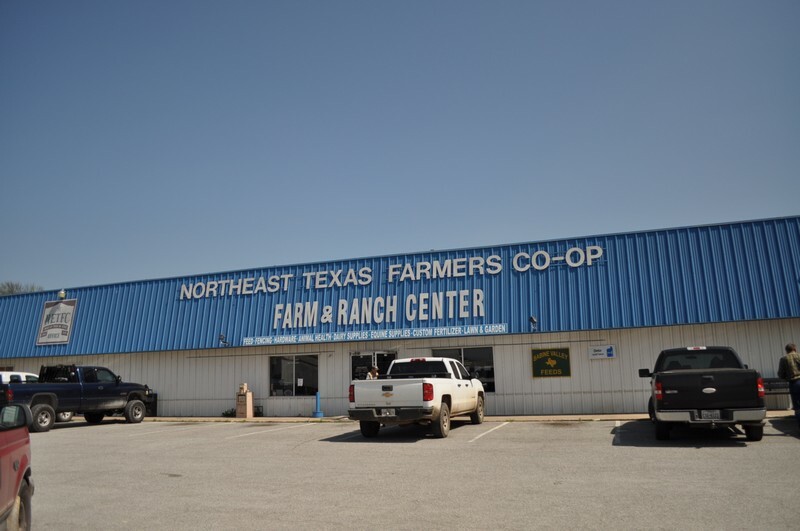 As the decade of the 80’s rolled in, the members and board realized the geographical swath the Cooperative served and changed the name of the association to Northeast Texas Farmers Co-op to reflect the geographical needs of agricultural and rural folks. In the early 1980’s, the dairies in this area had grown to exceed 300,000 cows. To keep up with our local agricultural needs, the Coop members built a new monolithic concrete feed mill at the Jackson St. location in 1982. State of the art computer controlled mixing and pelleting facilities enabled Northeast Texas Farmers Co-op to serve approximately 50% of the local mixed feed market. In 1984, the Co-op added a feed mixing and pelleting plant to its Greenville/Hunt County facility. This plant is still fully utilized to meet the bagged feed needs of member/patrons thru the Co-op’s 3 Farm & Ranch Centers and some 40 dealers throughout Northeast and East Texas. Sabine Valley Feeds are the brand these feeds are marketed under. The early 1990’s saw the Sulphur Springs feed mill expand with the construction of a Commodity Mixing Facility adjacent to the feed mill. This facility would allow the Co-op to mix grains, proteins, and roughage into a total ration for livestock. This decade, the Co-op has seen a contraction, then a re-start of expansion based entirely on the premise that the cooperative is here to Serve Member/Patrons Needs. The construction of a Mineral Plant alongside the feed mill, the sale of the Greenville elevator, a comprehensive renovation of the Sulphur Springs Bulk Feed Mill, and the addition of the Canton Farm & Ranch Center have solidified the Co-op’s footprint in so many rural, agricultural people’s daily lives. Today, Northeast Texas Farmers Co-op proudly employs 102 people. Over 90,000 tons of feed is now produced annually to help generate over $41 million in sales thru its 2 feed mills, 3 Farm & Ranch Centers, and 2 bulk fertilizer plants. Agricultural needs of folks are actively served in 12 counties in East/Northeast Texas. Northeast Texas Farmers Co-op membership stands at over 6,000 agricultural members. Members must be classified as agricultural producers per Chapter 52 of the Texas Agricultural Code. Of course, the Agricultural Cooperative form of business is open to all folks, member or non-member, who may choose to do business with our Cooperative. This is highlighted by the fact that 37% of the Co-op’s almost $42,000,000 business is non-member. We are proud to serve both city folks and country folks. Members own $2,546,000 of preferred stock earned through doing business with their Co-op. Since 2006, $724,277 from patronage dividends and stock retirement has been returned to member stockholders. 100% local ownership of Northeast Texas Farmers Co-op assures that this money helps our local economy. The governance structure centers on the membership. The members elect a 9-member board of directors who set policy and direction for the Co-op. Currently 4 of the 9 members of the board are Hopkins County producers. Hunt, Kaufman, Upshur, Camp, and Van Zandt Counties are also represented in the current board make-up. Harold Bryant, of the Gafford Chapel area in Hopkins County, serves as the President of the Board.